The left lives from social crisis to social crisis. Now it is leaping nimbly away from its last mess, the great crisis of the uninsured (who have decided to stay uninsured despite Obamacare's fines) over to the great crisis of income inequality. or the cost of living, but a crisis of CEO salaries. If only the great beast of government slumbering in the chilly waters of the Potomac would bestir itself to raise taxes on the rich some more we could move on from those $4 trillion government budgets we can’t afford to $6 trillion government budgets that we really can’t afford. The crisis of income inequality, in which some people make a lot more money than everyone else, is irrelevant in an economy where the problem is not that incomes aren't high enough, but that they don't buy enough, and that on the second term of the man who claimed to be able to lower the water level of the oceans, there still aren't enough jobs at minimum wage or any other wage. A look at why the price of food or used cars have risen so sharply under Obama would raise all sorts of troubling questions that that the left has no interest in exploring. Like O.J. Simpson, it already knows who the guilty party is. It’s the smug face looking back at it every morning in the mirror. The left’s answer to the high price of medical care wasn't to discuss why prices were so high and what was behind the bizarre dysfunctional pricing ecosystem, but to wrap the whole thing up in one big government mandate complete with a planned medical economy of price controls and resource limitations administered by death panels whose existence they deny. Its solution to cost of living issues is to raise the minimum wage. That's a slogan that sounds good, because everyone knows more money means more money. At least until you remember that the dollar, like an Obama promise, has no absolute buying power value. And the availability of jobs isn't a fixed value either. Raising the minimum wage eliminates jobs and raises the cost of living so that those who keep their jobs now have more money that buys the same amount. Raising the minimum wage to help the poor is a matter of destroying the village to save the village and then rebuilding a smaller version of it. But the left’s agenda isn't to make life better for the people at the bottom of the economic ladder. It's to build up their planned economy with failed solutions that aren’t meant to solve anything. The left's solutions don't work, because the problem they’re solving isn’t economic inequity, but their own lack of absolute power. And they solve that problem with economic solutions that fail, necessitating more power grabs until they have complete control. The progressive solution to income inequality is government intervention. But when has centralization ever produced income equality? The USSR was the ultimate experiment in central planning. The Soviet Constitution declared, "The principle applied in the U.S.S.R. is that of socialism: From each according to his ability, to each according to his work." The Soviet Union was supposed to be a classless society. Western leftists assumed that was true. They were wrong. Not only did the Soviet Union have a rigid hierarchy of classes, but it had the same income inequality as any other economy in its class. After WW2, the wealthiest ten percent of Russians took home more than seven times as much as the poorest Russians did. Factory bosses took home 100 times the salary of factory workers. Managers made five times what their employees did. A small percentage of the country wallowed in luxury while a sizable underclass struggled to put food on the table. And these figures are hopelessly inadequate to describe real income inequality in the USSR because most of the real income at the top went unreported because it was derived from corruption and bribery which were and are widespread. Official income in the USSR was only a fraction of real income which came from access to power. The Soviet black market was the real source of much of the wealth of the Soviet official who used his position to divert goods into the black market and even of the Soviet worker who could get rich on the side if he was fortunate enough to have a position in a factory that produced something worth stealing. But it wasn't income inequality in the USSR that led to poverty and misery. It was the planned economy whose control of the means of production created product shortages by not producing what people wanted, rather what it thought they should have, and whose control over the means of distribution made the black market into the only real source of needed products. The gap between the rich and the poor matters less than what the poor can buy for their money. That is why the left would rather talk about income inequality than the standard of living. It wants to play around with wealth redistribution, instead of dismantling their programs that make life so expensive. The same hypocrites jabbering about income inequality dream of imposing a Green carbon tax on everyone that will further raise the prices of all goods and services. The left inflicts poverty and then campaigns against it. It raises the prices of products and the cost of services, it devalues incomes, destroys jobs and raises energy prices… and demands even more regulatory powers so that it can finally solve the poverty mess it creates once and for all. The United States has three times the income inequality rate of the Post-Communist Slovak Republic. But do you really want to live in the Slovak Republic, the second poorest member of the Eurozone, where the average monthly salary is barely above a thousand dollars a month and prices aren't nearly low enough to make up for the difference in disposable income. Income inequality doesn't always mean prosperity. It can mean that, as it does in Mexico, that an elite has locked up the economy. It can also mean that the economy is productive. Income equality however usually means stagnation. Even more often it means that much of the real economic activity is unregulated, taking either in a black market or abroad. Outside of the class warfare agenda, income inequality is not in and of itself meaningful. It exists as a political slogan. Even if we assume that income inequality, rather than the standard of living, is the issue to focus on, the worst possible way to achieve it is through more centralization. Free enterprise top 1 and 10 percent incomes are vulnerable to market fluctuations. That's not the case in the Socialist sphere where incomes remain high regardless of economic performance. A CEO who runs a company as badly as Obama runs the country risks his job. Obama risks nothing. Neither do the army of staffers and bureaucrats, many pulling down six-figure incomes, who make up his regime. Washington D.C. is a great place to talk about income inequality because it has one of the highest levels of income inequality in the country. Obama declared that income inequality is the defining challenge of our time. It's a challenge localized in the very cities that voted for him. Progressives might try to argue that Obama won those cities based on the support of the poor, not the rich, but he also won 8 of the 10 wealthiest counties in the nation. Not only did he win them, but he won them by margins greater than the national vote. And that shouldn't be surprising, since of the wealthiest men in America, numbers one and two were both strong supporters of his campaign. But the left doesn't actually hate the rich. To do that it would have to hate itself. Occupy Wall Street wasn't a bunch of unemployed workers looking for a more compassionate economy. A third of the Occupiers had household incomes of six figures. The majority were college grads and 39 percent of the latter had graduate degrees. The left does hate people who work for a living. The poster child for its childish screeds is Elizabeth Warren, a populist voice of the people who spent three-quarters of a million on a condo as soon as she got to Washington D.C. and once scored $90,000 from the government for serving as an expert witness. Elizabeth Warren was right and wrong when she said that no one gets rich on their own. There are people who do get rich on their own. And there are people like her who get rich through their political connections. The left hates people who work for their money and get rich on their own. It loves "public servants" like her who get rich off their “community” political connections. 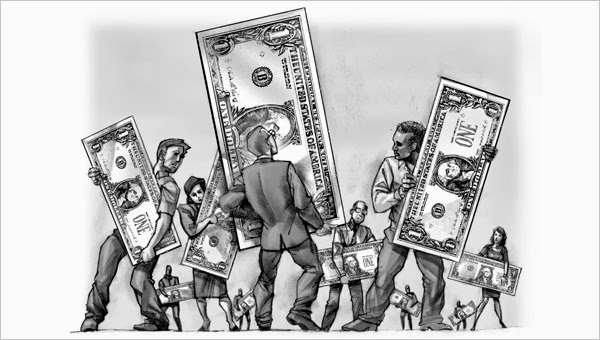 The left argues that the income inequality in this country shows that we have an oligarchy. They're right. And they're the oligarchy. 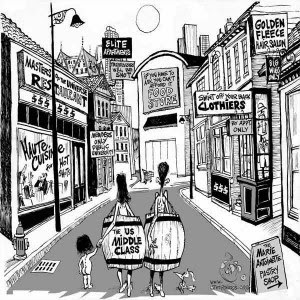 In Washington D.C. there is an oligarchy that monopolizes wealth and loots the working people. It's not a capitalist oligarchy even though it includes plenty of CEOs. It's a government oligarchy just as it was in the Soviet Union. The left's hypocrisy on income inequality is so obscenely ridiculous that it surpasses satire. Warren Buffett, the second-richest man in America, made billions from a bailout that he helped shape, and then campaigned with Obama against income inequality complaining that the rich were not paying enough taxes. Because if the rich paid even more taxes than they already do, he would be able to profit from even more government bailouts when progressive profiteering from government-mandated social justice mortgages goes awry. America doesn't have an income inequality problem. It has a government problem. The growth of government has lowered the standard of living. The standard of living peaked before Obama took office and then fell in the sharpest such drop in recorded American history. The left can shriek about raising the minimum wage all it likes, but the American worker today makes 57% less an hour than he did in 1970. The left's class warfare is built on a foundation of fake money and lies. Its governments can play with these numbers all they like, but they cannot and will not restore the standard of living that Americans had in 1970. The argument is difficult to present in a low information society--unfettered capitalism, paradoxically, generates greater wealth for the many though greater degrees of inequality. But a citizen, when given the hypothetical choice between a program which doubles his income in five years while the rich quadruple theirs, or a program which doubles all incomes in ten, choose ten. 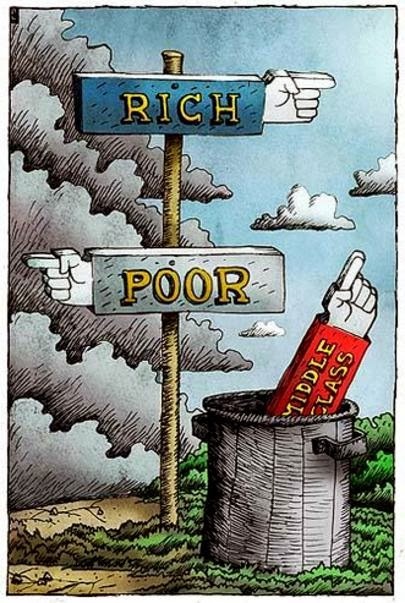 When there are not more rich getting richer, everyone is getting poorer. A highly regulated capitalist economy lives at the pleasure of government and more closely resembles the Soviet one. Great article as always. Not that you should take it personally but I wish I was busier and had no time to read your great articles. Being in sales I know just how bad this all is.There is not a growth sector in this economy. You can get rich and people more talented than myself do every day but they have to be extraordinary and even then it catches up. I know world beaters who now sound desperate and have lost their healthcare as well. These are people who made it. Who have shown they can produce when allowed. We lack the people who can communicate the problem and that is by design. Repub strategists do not want Tea Party rallies they want studies, money to "fund" the studies and money not spent on actual campaigning. I believe there were opposition parties in authoritarian nations that were pretty much the same way. When the dictatorship fell so did the "opposition". In a socialist economy your status is not based on what is promised you. Your status is how quickly you are served when something breaks down. The peons live in broken houses, with broken cars, broken appliances and come from broken homes. Leftists don 't understand economics. If they did, Soviet Russia and it's satellites would have been the most prosperous nations on earth and western leaders would have flicked to Moscow to study their illustrious wealth and prosperity. It’s not that this is new, but now it’s so in our face. They almost snicker when they lie their grand lies about demanding the rich pay their fair share, as though they know we know but what difference does it make? There’s nothing we can do. I agree with Mr. Knish on most points in the piece. Unfortunately, in our new capitalism the top guys that hurt, break, ruin, or damage a company usually set themselves up with a golden/platinum parachute so that they really don't pay a price when they leave. If they do their job, witness Mulally, they become so rich it is ridiculous. Often, these thieves wind up better financially when they leave than when they started. The Left: "Its solution to cost of living issues is to raise the minimum wage." Thus putting even more jobs of reach of those with minimal or no job skills and work ethic. Mainly teens. Black teens. Who turn to "knockout" games to pass the time and combat their boredom. Nice legacy. The left spend most of their time searching for "victims". Here in England, when they were running out of stock, they imported a few million more " A happy coincidence (for them) was that these new victims invariably voted for the left. What's the maximum permissible level of economic inequality in society, expressed as a ratio of the lowest income to the highest income? Defend your choice. Explain how it applies to movie stars, sports figures, and other celebrities. Show all assumptions and steps in your calculations. For extra credit, address these points: Does this target ratio ever change? How does society know when it's time to change it, and in which direction, and by how much? Be explicit. Get-an-A-for-the-term question: How would society achieve and maintain your income ratio without causing civil insurrection? Be specific. Fuzzy terms such as "fair share" and the like will not be accepted in any answer unless its meaning is exactly specified in numbers. Excellent article. I've discovered your writing a few months ago, and I admire your work. Regarding the article, I always find it amusing (in a bad way) that almost nobody seems to understand what leftists mean when they says "the rich". Possibly most rank-and-file leftists don't understand it themselves. People seem to think that the meaning of "rich" is powerful, ruthless tycoons who make a fortune and control huge chunks of the economy. Everyone who harbors some envy or grudge against anything, naturally feels animosity toward this sort of bogeyman as well. But when the left says "the rich", it means something much simpler: anyone who has money at all, and has earned it. Only those who have stolen the money that they have, preferably by mass coercion through legal means, are exempt from this basic definition of property as inherently illegitimate, which is at the heart of the leftist ideology. You may know the traditional principle in the Halacha, "one who stole from a thief is not liable". The original meaning of the principle notwithstanding, it seems that for the left, anyone who has any money or property is a thief - and the leftists, by "re-stealing" this "stolen" property, become absolved and decriminalized from the otherwise universal state of theifhood. This is what redistribution really means: an anti-religion, in which the only way to become free from an imaginary "original sin" of humanity is to commit it in practice on a grand scale while turning all the imagined "sinners" into your very real victims. And then, all the common folks who naively thought that "the rich" will pay more and "the working people" (i.e. those same folks) will benefit, belatedly discover - in their paycheck, at the supermarket - what the real intention of "rich" was. It was them, and only them. Thanks Daniel! This sentence describes the left perfectly, including their insincerity regarding their concern for the poor, their need to create victim groups to whom they then apply their 'sympathies', their actual inability to cogently define their objectives and methods (hence the denunciation, vitriol and pure hatred of the Right), and the Orwellian reversal: failure means success. Your mention of high cost of cars grabbed me. I bought a new car for the first time in my life last year (I'm 40). Prior to this I favored old cars, the kind built with real metal bumpers. A buddy of mine who sells cars explained to my why the used cars are so expensive this way: the auto industry bailout. Essentially, no one really needed a new car anymore, because there were all these well-made older cars that take a lickin' and keep on tickin. This situation was bringing new car sales to a standstill. So during the bailout, there was a huge nationwide effort to herd in as many used cars as possible and send them to the graveyard to be crushed. This was happening to trade-ins, and also by the herding stick of the emissions laws to make people decide to switch to a different car that would pass the electronic emissions tests. With each decision to find a different car (even if it was a used car), the car that was having trouble passing and causing them trouble and expense would be crushed - not put on a lot and resold. That is why prices have been driven up. Less availability means higher price. A Robin Hood mentality. Steal from the 'rich' (working and middle class) and give to the shiftless and lazy abled bodied Americans who feel entitled forever do to one grievance or another. Liberals fixate on the "eco" in "ecology, while denying the "eco" in "economy." "A CEO who runs a company as badly as Obama runs the country risks his job." Really? The company gets a bailout from Bush or Obama. The CEO gets a golden parachute. The shareholders are generally pretty powerless, plus with the bailout, why complain? A side note - you write "Obama risks nothing." Why do you think he couldn't be impeached (as others were before)? Of course, "income inequality" parallels "productivity inequality". That the middle class has been faltering is an artifact of their deteriorating and/or obsolescent job skills. For the upper classes, it the opposite.